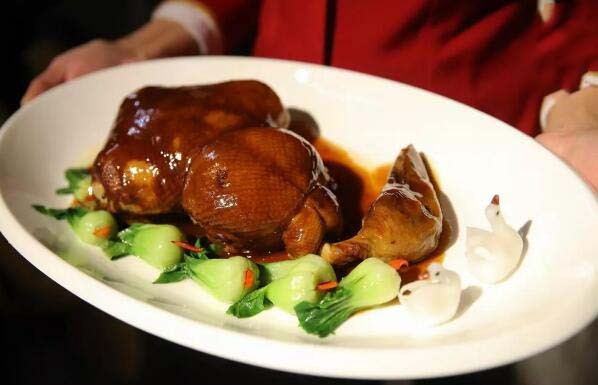 Eight treasure duck (八宝鸭) is one of the most famous dishes of Jiangsu cuisine in China. 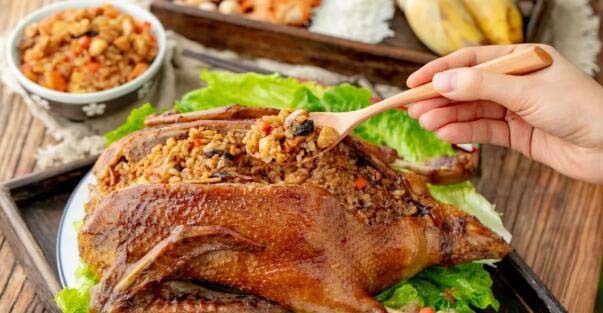 There are many ways people like to prepare this, but usually in high-end restaurants, they will completely remove the duck bones, stuff with the stuffing, and tie the duck shut with a knot and cooking string. However, removing the bones of the duck without breaking the skin usually requires professional training and lots of practice. So today I am going to teach you how to make this delicious recipe at home on your own. 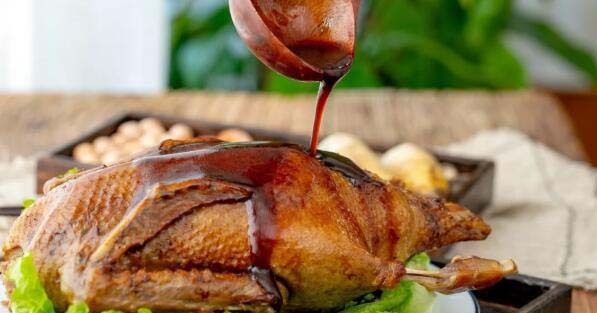 The ducks do not need to be boneless, filled in the filling and steamed directly into the pot, which is very suitable for home making. The ingredients of Eight treasure fillings generally include glutinous rice, bamboo shoots, diced meat, diced chicken, diced chicken, diced mushroom, lotus seeds, shrimp, etc., everyone can choose according to their own preferences. 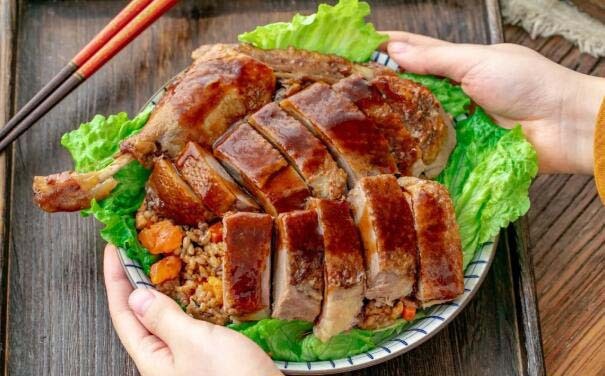 The scented Eight treasure stuffing, with the cooking time slowly blending with the duck, in order to be more convenient to eat, you can dig up the Eight treasure rice before the table, and cut and put the duck pieces on the Eight treasure rice. 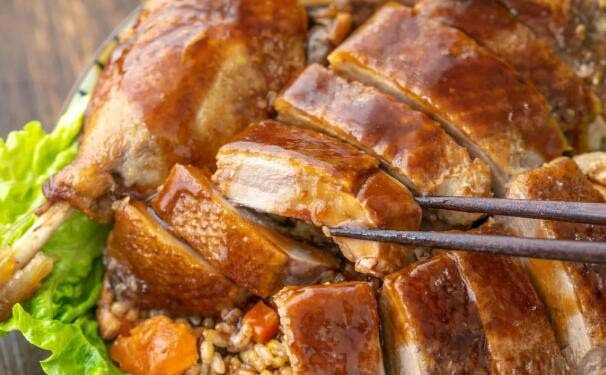 The duck meat absorbs the essence of the eight treasures, and the salty and tender. So let’s begin learning how to make this delicious dish. Step 2: Mix with 1 tsp of dark soy sauce and 1/2 tsp of sesame oil. Step 3: Cantonese sausage, chicken breast, winter bamboo shoots, carrots, and salted egg yolk are all cut into small pieces (about the size of a lotus seed). Step 4: Winter bamboo shoots and shiitake mushrooms are placed in hot water for 1 minute to soften. Step 5: Heat some oil in a pan, sauté the ginger and chopped green onion. Add all the cut and prepared ingredients and heat together. Then, add 1 tsp of dark soy sauce, 1 tsp of light soy sauce, 1/2 tsp of white sugar. Step 7: Fill the duck belly with the eight-treasure stuffing. Be careful not to fill it too tightly. Use a toothpick to suture the duck as shown below. Note: The ducks are salted overnight in advance, washed and then stuffed with eight treasures. Step 8: Boil some water, and gently pour over the duck to tighten and prepare the skin and allow it to color evenly. Step 9: Wipe the water off of the duck, and evenly apply the dark soy sauce(not included in the ingredients). Step 10: Place the duck on some ginger, boil the water in the steamer, and steam for 1.5-2 hours. Important: Keep an eye on the steamer so that it does not run out of water. If you like crispy duck skin, you can use the oven instead of steaming. Add 1 teaspoon of honey to the soy sauce when mixing. Wrap in tin foil, and bake it at 200°C for 80-90 minutes. Step 11: After steaming, there will be a lot of juices from the duck in the steamer. Put these juices in a wok and heat. Boil 1 teaspoon of dark soy sauce, a little sugar, and finally add 3 tablespoons of starch water to thicken, turn off the fire on the eight treasure duck. The rich sauce is poured on the duck, and the eight treasure duck can finally go to the table! I have cooked a lot of ducks, this dish is my favorite. When you bite into it, you can taste all the delicious ingredients come together in the tender and juicy duck meat. 1. The so-called “eight-treasures” means that there are eight things in the belly of a duck. Each person can mix eight kinds of ingredients according to the preference of themselves and their families. They can also increase or decrease the number of certain ingredients. 2. It is best to choose a fat duck of 3 to 4 pounds. At this weight, the ducks have the most fat, and the duck oil blends well with the eight treasures in the cooking process, making the taste of the filling more delicious. 3. Do not fill the duck too full! Because the rice is only cooked 80% of the way the first time around, it will grow during the cooking process of the duck. Therefore, it will expand inside the duck; if there isn’t enough room for it to expand, the seam keeping the duck closed could burst. The idea of this dish is to surprise people with the stuffing. You want it to look like an ordinary duck on the outside until you cut into it!